At the entrance of The Field Museum's Cyrus Tang Hall of China, two Chinese stone guardian lions stand tall, gazing down intently at approaching visitors. One lion's paw rests upon a decorated ball symbolizing power, while the other lion cradles a cub. Traditionally believed to possess attributes of strength and protection, statues such as these once stood guard outside imperial buildings, temples, and wealthy homes in China. Now, centuries later, they guard this incredible permanent exhibition. China's long history is one of the richest and most complex in the known world, and the Cyrus Tang Hall of China offers visitors a wonderful, comprehensive survey of it through some 350 artifacts on display, spanning from the Paleolithic period to present day. 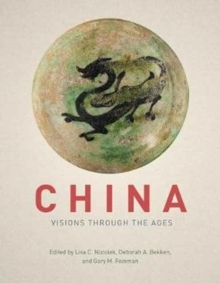 Now, with China: Visions through the Ages, anyone can experience the marvels of this exhibition through the book's beautifully designed and detailed pages. Readers will gain deeper insight into The Field Museum's important East Asian collections, the exhibition development process, and research on key aspects of China's fascinating history. This companion book, edited by the exhibition's own curatorial team, takes readers even deeper into the wonders of the Cyrus Tang Hall of China and enables them to study more closely the objects and themes featured in the show. Mirroring the exhibition's layout of five galleries, the volume is divided into five sections. The first section focuses on the Paleolithic and Neolithic periods; the second, the Bronze Age, the first dynasties, and early writing; the third, the imperial system and power; the fourth, religion and performance; and the fifth, interregional trade and the Silk Routes. Each section also includes highlights containing brief stories on objects or themes in the hall, such as the famous Lanting Xu rubbing. With chapters from a diverse set of international authors providing greater context and historical background, China: Visions through the Ages is a richly illustrated volume that allows visitors, curious readers, and China scholars alike a chance to have an enduring exchange with the objects featured in the exhibition and with their multifaceted histories.